Background: Parkinson's disease (PD), a debilitating and progressive disorder, is among the most challenging and devastating neurodegenerative diseases predominantly affecting the people over 60 years of age. Objectives: To confront PD, an advanced and operational strategy is to design single chemical functionality able to control more than one target instantaneously. Methods: In this endeavor, for the exploration of new and efficient inhibitors of Parkinson's disease, we synthesized a series of quinoline carboxylic acids (3a-j) and evaluated their in vitro monoamine oxidase and cholinesterase inhibitory activities. 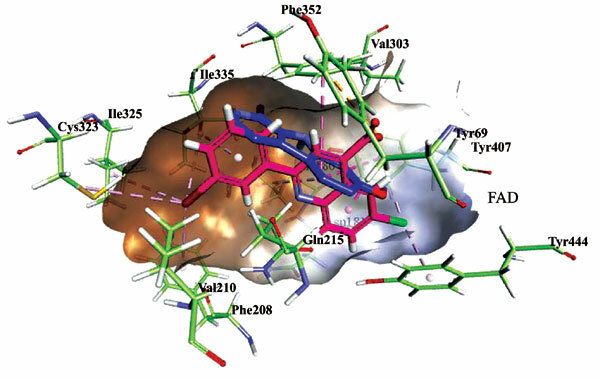 The molecular docking and in silico studies of the most potent inhibitors were performed to identify the probable binding modes in the active site of the monoamine oxidase enzymes. Moreover, molecular properties were calculated to evaluate the druglikeness of the compounds. Results: The biological evaluation results revealed that the tested compounds were highly potent against monoamine oxidase (A & B), 3c targeted both the isoforms of MAO with IC50 values of 0.51 ± 0.12 and 0.51 ± 0.03 µM, respectively. The tested compounds also demonstrated high and completely selective inhibitory action against acetylcholinesterase (AChE) with IC50 values ranging from 4.36 to 89.24 µM. Among the examined derivatives, 3i was recognized as the most potent inhibitor of AChE with an IC50 value of 4.36 ± 0.12 ±µM. Conclusion: The compounds appear to be promising inhibitors and could be used for the future development of drugs targeting neurodegenerative disorders. Cholinesterase inhibition, drug-likeness, molecular docking, monoamine oxidases, parkinson's disease, quinoline carboxylic acids.